We often find that nothing shakes up an outfit you're a little tired of like a pair of look-at-me shoes, and the mood-boosters of the moment are certainly silver shoes. The street style set has been fashion magpies when it comes to footwear this year, as at London Fashion Week we kept seeing the same pair of mirrored silver Topshop boots. These are, unsurprisingly, now all sold out, however, there's no shortage of shiny alternatives for you to pick from. We've done the hard work and pinpointed eight of the best silver shoes around, from Prada's mirrored Mary Janes to £26 silver sandals from Zara. Whether you're a trainer girl or you live in heels, there is bound to be a medal-winning pair waiting below for you. Scroll below to shop our edit of the eight best silver shoes to buy now, from trainers to Gucci loafers. These silver Prada shoes are the ultimate fashion item. 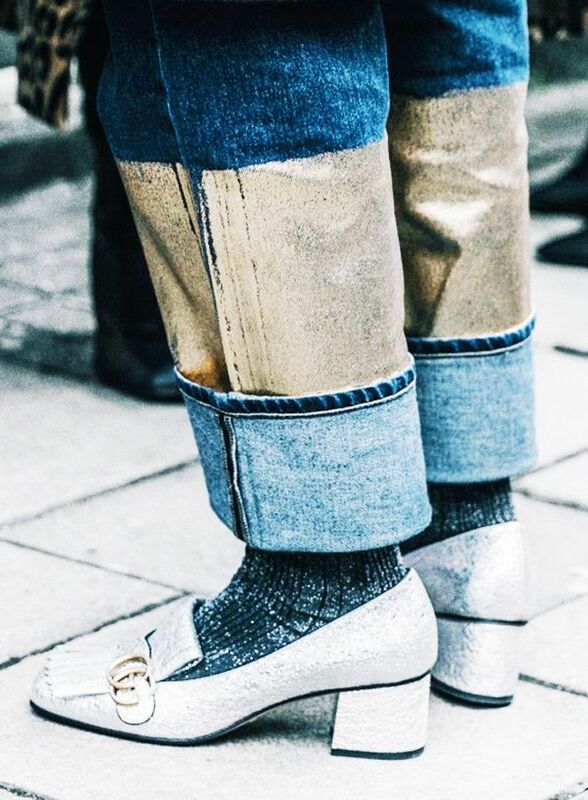 These Gucci loafers have been a fashion-week hit. The low block heels make these sandals super comfortable. These liquid-effect trainers are an Instagram dream. Dorateymur is a new cult London-based label, which makes these shoes an editor's top choice. According to our intel, Nike Air Max Thea trainers are some of the most searched-for shoes on Google. We love these glittery silver pumps with pointed toes. Silver boots have been some of the most popular shoes of 2017, and you can't go wrong with this pair. For more shoes, see our guide to the best ballet pumps.